MRFA Organization Become a member of MRFA! Learn about the association, Board Members, Officers, and download a membership application form! U.S. Army Explore points of interest in the US Army section; awards, citations, index, roster and select information related to the mobile riverine force! U.S. Navy Explore our Navy section: awards, stories, points of interest, origin of navy terminology and much, much more! Awards & Decorations Unit awards, medals and ribbons, and information on applying for and obtaining your medals and ribbons. Reunions and Gatherings Explore gatherings, speakers and events. Join us for our 2017 reunion by making a reservation today! Memorials Memorials and museums dedicated to the Mobile Riverine Force. MRFA Gear Locker Explore our catalog and purchase official MRFA gear here. Historical Data Project The MRFA is launching our “Historical Data Project” (HDP), featuring as much MRF TF-117 data as possible. Photos, Poetry and Stories Explore historical photos, gripping stories, poetry and song submitted by MRFA members. Links Links to friends, affiliates and other sites you should visit! Albert’s “Galley” Get the recipe! From Albert's Peach Cobbler to an Irish Chicken Dinner, we have them all! Guestbook Please sign the MRFA guestbook! Thank you for stopping by. More Anything and everything that couldn't fit in any of the other categories! Amid the chaotic fall of Saigon in April 1975 Capt. Kiem Do, deputy chief of staff for operations in the South Vietnamese Navy, secretly planned and quietly carried out the evacuation of thirty-five ships and some thirty thousand at-risk South Vietnamese. That disciplined retreat is only one of many little-known events of the war recalled in this revealing memoir, the first to be published in English by an officer of the South Vietnamese Navy. Also included are first-person accounts of skirmishes against the Binh Xuyen pirates, life with Diem and Madame Nhu, the foiled communist car-bomb attack on Saigon’s naval headquarters during Tet, and the 1974 sea battle between Red China and South Vietnam. 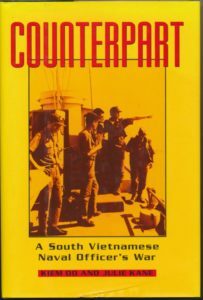 In addition to viewing particular events from a Vietnamese perspective, this book offers an intimate look at the human side of the war, at the Vietnamese culture, and at the relationship between the men of the Vietnamese Navy and their American counterparts-specifically, the naval advisers who crossed paths with Kiem. Eyewitness to decades of turmoil, Kiem was born in Hanoi in 1933 and lived a life of adventure. By the age of thirteen he was scouting for the Viet Minh and blowing up French troop trains. By twenty-one he was in France attending the fabled naval academy in Brest as a midshipman in the brand-new Vietnamese Navy. By the 1950s he was fighting for South Vietnam against the communists-and his own brothers. By late April 1975, as the enemy’s army was closing in on Saigon, Kiem was making the decision of his life: should he try to save his navy’s ships and thousands of his countrymen, or accept his counterpart’s offer of plane tickets to safety for himself and his family? Coauthored by a prize- winning American poet, this book conveys what the Vietnam “experience” was really like for our often-overlooked allies. Kiem Do, a resident of Gretna, Louisiana, worked for twenty years as a cost engineer for a Louisiana utility company. Julie Kane, a former George Bennett Fellow in Writing at Phillips Exeter Academy, has published three collections of poetry. She is completing a Ph.D. at Louisiana State University. We welcome content contributions! Click most pictures to enlarge. © 2019 MRFA.org. All Rights Reserved.